Tonight i made this soup for dinner. It was delicious! We ate it all up! It is also healthy. YAY! =) It's from my Better Homes & Gardens New Cookbook. 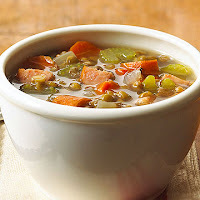 In a large saucepan combine broth, water, lentils, celery, carrot, onion, dried thyme (if using), cayenne pepper & garlic. Bring to boiling. Reduce heat. Simmer, covered, for 20 to 25 minutes or until vegetables & lentils are tender. Stir in sausage & fresh thyme (if using). Heat through.